-- Select a Size -- 6-10" - Out of Stock! 10-16" - Out of Stock! 14-20" - Out of Stock! 18-26" - Out of Stock! 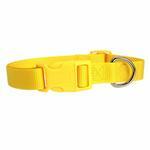 Add some color to your dog's day with the Zack & Zoey Nylon Dog Collar in Yellow! The Zack & Zoey Nylon Dog Collar in Yellow is a durable and fashionable basic style that will brighten up any occasion. This cheery dog collar features an easy to use plastic quick-release buckle and a nickel-plated D-ring for leash and tag attachment. It's a bright color that will get your dog noticed. 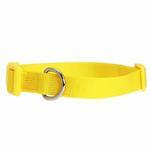 Our yellow collar is a great choice for sports fans that like to outfit their pup in support of their favorite team's colors. Football fans that will love our Zack and Zoey yellow nylon collars and leashes include the Minnesota Vikings and the San Diego Chargers. Baseball fans that will embrace our yellow Barking Basics line include the Pitsburg Pirates. There are lots of basketball fans that love yellow including our own Denver Nuggets, the Golden State Warriors, and the Los Angeles Lakers. Nylon Dog Collar by Zack & Zoey - Yellow Customer Photos - Send us your photo! I love this collar, its so brightly colored and the matching hardware is a nice touch. Zoe is a Teacup Yorkie 3 months, 1 lb. 13 oz. A Real Treat. Again, yay! My 1st 1 got chewed, so been anxiously awaiting whether more would come. Love the color...matches lots. Nice and bright. And best for safety walks! Posted On 05/18/17 by Katie W from Symsonia, KY Yes, Katie W recommends this product! My Lucy is a red/apricot toy poodle and this yellow collar just pops against her fur! I absolutely love it! It cleans up very well. I hand washed and laid flat to dry and it looks every bit as bright as it did on the first day. I also like it comes in 3/8 inch wide. Posted On 03/12/17 by Susan G from West Lawn, PA Yes, Susan G recommends this product! This zesty lemon yellow color adds a vibrant zing to coordinate with summer apparel. It is easy to put on and remove and our Boomerang dog tags fit on it quite nicely. Posted On 06/24/16 by Jay M from Antioch, IL Yes, Jay M recommends this product! Sadie loves her new collar... and yellow is her new favorite color! Posted On 12/29/15 by mel from , MI Yes, mel recommends this product! Zack & zoey products are well made. Bright colors - love this yellow. Looks great on my pup. Posted On 12/23/15 by mel from , MI Yes, mel recommends this product! Love Zack & zoey products great quality. And vibrant colors. Best yellow collar I have seen. Posted On 12/18/15 by mel from , MI Yes, mel recommends this product! Posted On 09/13/15 by Verally C from Chicago, IL Yes, Verally C recommends this product! Cute and simple. It's hard to find a cute yellow collar. Posted On 06/30/15 by Mary S from Thousand Oaks, CA Yes, Mary S recommends this product! 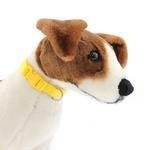 This yellow collar is bright and cheery. A perfect color for summer. Posted On 12/04/14 by Elaine S from C I, NY Yes, Elaine S recommends this product! The color is nice and bright. Very strong and will not unsnap when pulling. Went nice with the dress I bought. Love all your products, my dog loves them too!